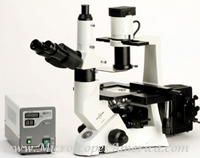 Accu-Scope 3032 Series inverted Microscope Lowest Price and Free Shipping! EMBRYOLOGY, TISSUE CULTURE, PHARMACOLOGY, AND IMMUNOLOGY APPLICATIONS. Incredibly Sharp, high contrast images driven by ACCU-SCOPE’s AIS infinity optical system make the 3032 inverted microscopes an outstanding performer for routine applications in embryology, tissue culture, pharmacology and immunology. The 3032’s ergonomic, modular design allows users to add a fluorescence illuminator with a 2 position filter cube slider. A third position on the filter slider is left open to quickly switch to brightfield or phase contrast. A wide variety of accessories allow the 3032 to be used for examining cell viability in petri dishes, culture flasks and well plates. Using ACCU-SCOPE’s Micrometrics® cameras and SE Premium software, the 3032 can easily be optimized for digital imaging. 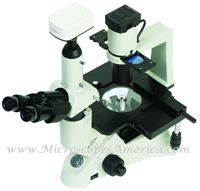 An inverted microscope featuring ACCU-SCOPE’s AIS infinity corrected optical system, this series is an outstanding performer for routine applications in embryology, tissue culture, pharmacology and immunology. This new microscope series incorporates the most advanced optical and mechanical components with exceptional value, versatility and performance to meet the exacting requirements of life science professionals in EPI Fluorescent applications. The 3032 Series incorporates B & G excitations as standard on a three position cube slider. With the integrated 100 watt mercury light illuminator and high resolution AIS Plan Fluor Objectives they provide unsurpassed performance and value. There are a variety of excitation cubes available allowing for the system to be customized. Accu-Scope's New AIS infinity optical system with their Plan Fluor objectives provide supperior clarity in fluorescent applications. A side facing quintuple nospiece provides maximium flexibality for a variety of objective combinations. Included on all configurations are large viewing (22mm) Wide Field 10x focusing eyepieces. A trinocular viewing head is standard that is ergonomically designed for comfort with an interpupillary distance adjustment range of 48 - 75mm. The condenser is ELWD (Extra Long Working Distance, 72mm) with a N.A of 0.3, removing the condenser increases working distance to 150mm. The illumination system is 100w mercury with power supply and includes 100w HBO lamp and UV protection plate. Also included on all models are FITC/GFP and DAPI fluorescent filters. The system is available in both bright field and phase contrast configurations. These systems are ideal for use in universities and laboratories where critical viewing is required. 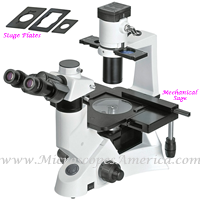 Description: For this microscope please read this description thorougly. This is a complete package. It is one of the most advanced EPI-Fluorescent systems on the market today. This infinity optical system with Plan Fluorescent objectives provides exceptional clarity in fluorescent applications. A side facing quintuple nospiece provides maximium flexibality for a variety of objective combinations. Comes with large viewing (22mm) Wide Field 10x focusing eyepieces. A trinocular viewing head is standard and is ergonomically designed for comfort with an interpupillary distance adjustment range of 48 - 75mm. The condenser is ELWD (Extra Long Working Distance, 72mm) with a N.A of 0.3, removing the condenser increases working distance to 150mm. The illumination system is 100w mercury with power supply and includes 100w HBO lamp and UV protection plate. Also included are FITC/GFP and DAPI fluorescent filters. The system is also available in both bright field and phase contrast configurations. These systems are ideal for use in universities and laboratories where critical viewing is required.